It is clear that stress is not something just you and I experience, millions and millions of people in employment experience an unhealthy amount of stress and anxiety. In fact, a recent study with Eos Scientific found that almost a third of Brits, or 15,262,293 of the adult population, believe that their mental health is in worse shape than it was five years ago thanks to a poor work-life balance. To be honest, if you looked around at most of the population, you'd think that being stressed, anxious, depressed, irritable, addicted to caffeine and craving salty or sugary foods was normal human behaviour. But just because something is common doesn't make it normal. The effects of stress can manifest in multiple ways but the most common symptoms can be found on your head and it can present itself physically through ways you might not be aware of including an itchy scalp, increased oiliness, hair shedding, reduced hair volume and hair breakage. Hair is an important piece of the picture we present to the world every day. It affects how you hold your head and how you move your body, and it can influence how you feel about yourself on any given day. Hair can also be indicative of health—if your hair is full and shiny, it imparts a vibrant image of wellness. If it's falling out or thinning, it could indicate an underlying problem. So, how can you keep your hair as healthy and happy as possible? We spoke to Anabel Kingsley, trichologist at Phillip Kinglsey, about the five hair signs that can signal stress and ways to bring it back to life. “It’s important to realise that as hair is non-essential tissue, it is one of the most sensitive barometers to physiological and psychological health, and therefore to stress. During every consultation at our London and New York Clinics, we ask if the client has recently been under, or is currently under, stress - and more often than not, the answer is ‘yes’. It can be a vicious cycle as hair loss and scalp issues in themselves can be incredibly stressful to deal with. “Stress commonly triggers and/or worsens flaking and itching of the scalp – especially if you are already prone to dandruff. This is because stress can affect hormone levels, and this in turn may disrupt the micro-flora of the scalp. Flaking can cause hair loss, and scratching may result in further irritation and even abrade the surface of your scalp, so it’s important to tackle it ASAP.” says Anabel. Rosemary verbenone is known for its cellular regenerative abilities and is recommended for treating an itchy scalp. Emotionally, it clears the mind and restores psychological balance. Chemically, verbenone is a mild ketone and should be avoided with children and during pregnancy. Add rosemary verbenone to your shampoo at a 2 percent dilution. Continue normal use for a month. For even better results, swap out your shampoo for one that does not contain popular drying ingredients sodium lauryl sulfate (SLS) and sodium laureth sulfate (SLES). It's a common belief that losing up to 100 hairs a day is completely normal, but what happens when you start losing more than you expected, even by the handful? Not only can it induce panic, it should raise questions about why your hair is falling out at such an alarming rate. “Stress can have a negative impact on general health - and this can have a knock-on effect on your hair. Again, this is because hair is non-essential tissue. Very commonly, people find that their hair comes out in excess 6-12 weeks after a period of stress. You may notice more hair in your shower and brush, when you style and on your clothes and pillow.” Says Anabel. “Women may play with their hair when they are stressed, and often they are not conscious of it or aware of the extent to which they are doing it.” Says the Phillip Kingsley trichologist expert. “The act of hair twiddling is usually harmless, but if done roughly or frequently, may break strands, and can even pull them out." Women make up around 40 percent of hair loss sufferers and even recently Jada Pinkett Smith spoke out about her struggles with losing her hair on her new Facebook show, Red Table Talk. "A lot of people have been asking about why I’ve been wearing a turban. It’s not easy to talk about. I’ve been having issues with hair loss. It was terrifying when it first started," the Girls Trip star revealed. "I was in the shower one day, and clumps of hair just came out. I was literally shaking with fear. That’s why I cut my hair—and why I continue to cut it." And while tactile solutions are incredibly hopeful for many, there’s something empowering about Pinkett embracing this dramatic change as a practice of self-love and acceptance, too. "Even in my terror and fear, I had to put it into a spiritual perspective. The Higher Power takes so much from people," she shared with her daughter Willow Smith and her mother Adrienne Banfield-Jones, the other two co-hosts of the show. "People with cancer or sick children. I watch the Higher Power take things every day, and by golly, if the Higher Power wants to take your hair, that’s it?" Pinkett went on to explain how investing in this perspective helped her shift her outlook on the loss. 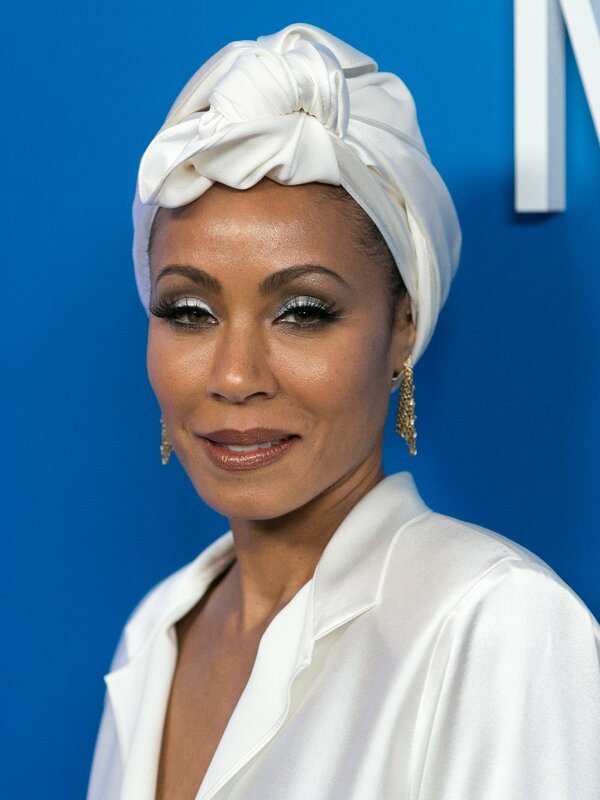 Now Pinkett can be seen wearing an array of colorful and adorned head wraps, another way the actress chooses to face her hair loss head-on, in a new light. "When my hair is wrapped, I feel like a queen," she mused. How Long Does Your Meal Prep Actually Last For?